Revel in the architectural splendour, as you take an intimate look at this imposing fort, built by Akbar's comtemporary Raja Rai Singh. Within the fort are thirty seven palaces and pavilions. Suraj Prol or the Sungate is the main entrance to the fort. The most beautiful palaces in the complex are the Chandea Mahal, Phool Mahal and Karan Mahal. 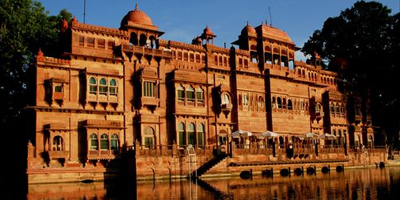 The Palaces, exquisitely built in red sandstone and marble are ornate with mirror work, carvings and paintings. An array of kiosks and balconies embellish the fort at intevals, breaking the monotony. A museum with valuable miniature paintings and rare antiques is also located in the Junagarh Fort. (5 Km.) Beautiful 16th century Jain temples, dedicated to the 23rd Tirthankar Parshvanathji. 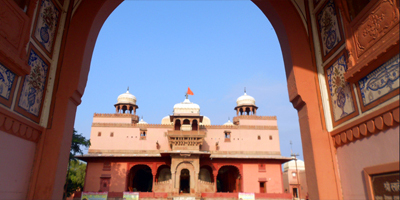 Other important temples of Bikaner include the Lakshminath ji, Ratan Bihariji, Shiv Bari and Nagnecheji temple. the Bhaironji temple at Kodamdesar, about 40 Kms. 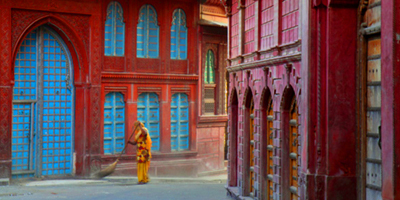 from Bikaner, is another noteworthy temple. Spectaular in structure and beauty, Bikaneri Havelis are mini castles reminding us the days of Rajputs. 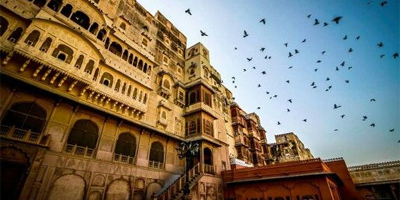 These haveli's belonged to nobles in King's Durbar or businessmen of ancient times. Carved windows and doors alongwith marvellous use of Italian tiles on the floor are sure to catch your attention. 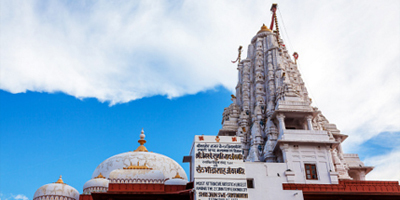 Offer your prayers to Karni Mata - an incarnation of Goddess Durga, at this 600 years temple. 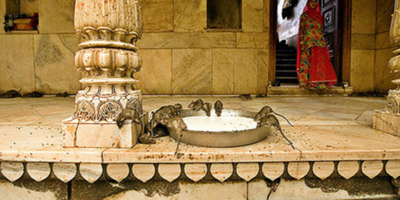 The temple offers a haven to rats. Devoteed feed the rats, owing to the belief that these rodents will be reincarnated as holy men. The entrance archway of the temple is intricately carved in marble. This is a royal crematorium with cenatophs of the house of Bikaji Rathore. 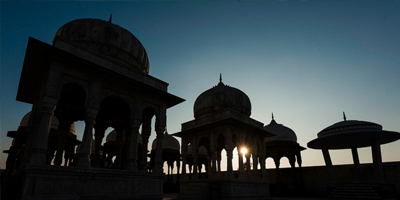 Many decorated chatris, built in the memory of the Bika dynasty, offer splendid example of the Rajput architecture. Watch flocks of imperial sand grouse, as you wander through the lush foliage of woods located on the Jaisalmer road. Gajner is also home to neelgai, chinkara, wild boar and black buck. Gajner palace, a summer resort of kings built on the beautiful lake along the sanctuary, is a spot worth visiting. A sacred spot, dedicated to Kapil muni. The temple here is the venue for a fair in the month of kartik (Oct-Nov), attracting thousands of pilgrims. 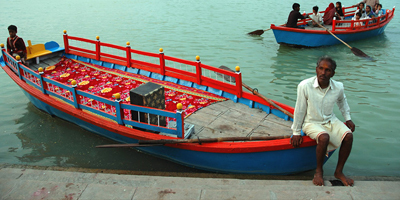 Kolayat is an idyllic picnic spot as well. 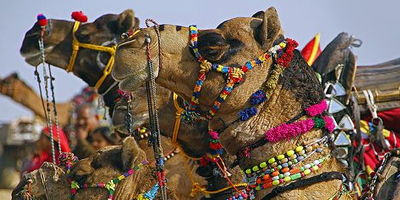 Acquaint yourself with the indispensable ship of the desert at this camel research and breeding center, the only one of its king in Asia. Built in the 19th century by Maharaja Dungar Singh ji, the temple is encircled by a high wall. Beautiful paintings and Nandi bull facing the Shiva Lingam are the attractions of the temple.